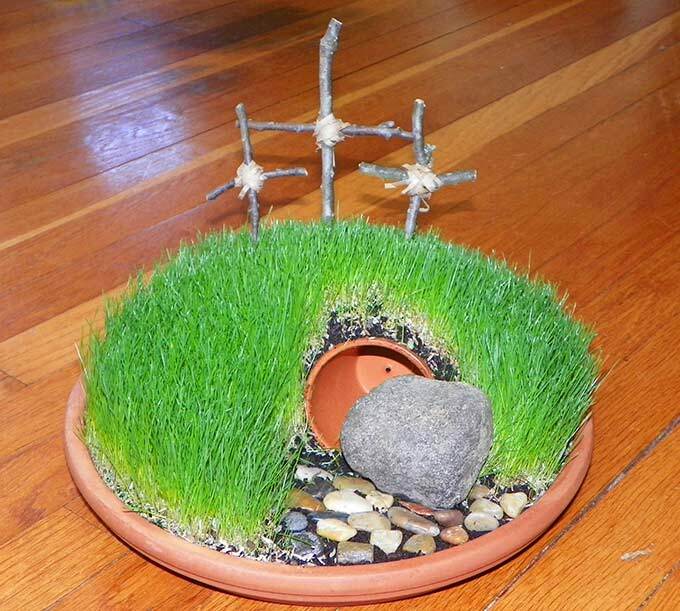 This DIY Easter Mini Garden is so sweet and easy to plant. 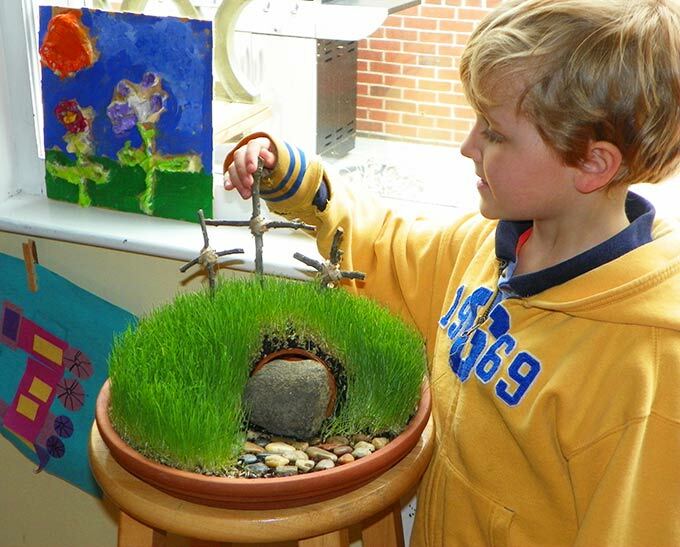 A mini garden brings days of anticipation and wonder for kids 1-99 as the garden grass sprouts just in time for Easter. This is a great classroom project and brings cheer to a nursing home or sick room. Easter’s not so far away. For me, Easter brings thoughts of new life and hope…green shoots poking through the ground after a seemingly interminable winter of snow and ice. The anticipation of spring and new growth, welcome after a long winter. 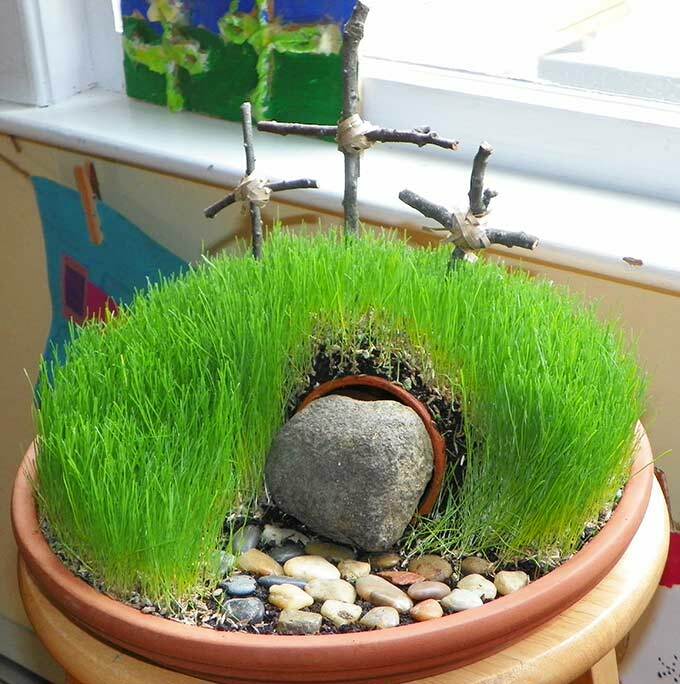 The empty tomb in the garden symbolizes hope. Build it together with your kids, grandchildren or other special kids in your life. Charlie and I planted a DIY Easter Mini Garden several years ago. First we went on a meandering nature walk around the pond, hunting for just the right rock, stones and twigs before planting the garden. You’ll need about two weeks from planting the grass seed ’til it’s ready. Plant the seed about three weeks before Easter to enjoy it before and after Easter. 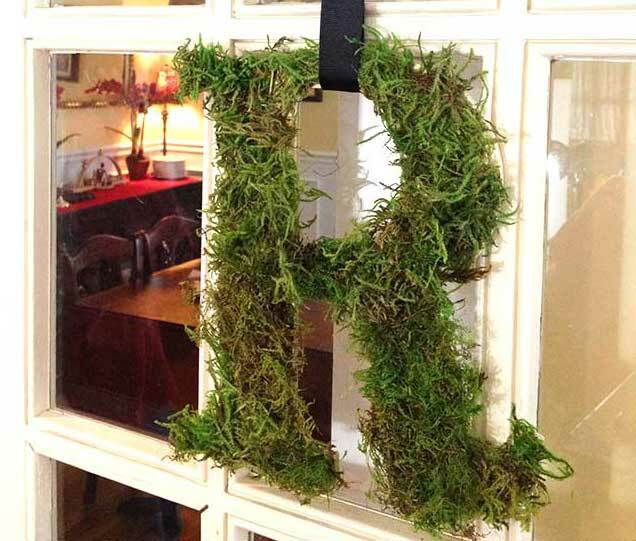 When the grass is thick and lush, just a few snips with scissors or kitchen shears keeps it in nice shape for Easter. Place the small terra cotta pot on its’ side in the the saucer. Place the stones into the soil in front of the tomb. Mist the soil well, so it’s ready to receive grass seed, then press grass seed thickly all over the soil. Place the rock in front of the tomb. Use raffia or string to tie together twigs to make rustic crosses, add them to the garden. Mist the grass seed several times daily and watch for your garden to sprout! Hide a few speckled eggs in the grass Easter morning! This is such a cool project to do with kids! I've never seen anything like it before. Thanks for sharing Allie! This is an interesting project, one I think my grandchildren would enjoy. I plan to forward this to Jenny and the boys. Thanks. This idea is so cool. I will be sharing. I love it!! Gonna do it with Luke. Thanks for the fun and meaningful Easter idea! I think I'll make one for MY house. What a great Easter demo! A vivid picture of the meaning of Easter! Great! What an awesome idea! 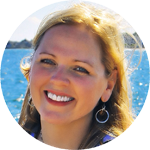 Thanks so much for sharing, Allie! Allie!!! I love this...definitely want to do this with my grandson! I’m picking up the “ingredients” tomorrow ! It will be such a fun project with the grandkids. Thanks for such a neat idea! What a lovely project Allie. I will tell my daughter to try this project. I am sure she would love it. :) Thanks, Allie. This is a very wonderful project to do. Especially with the spring season fast approaching, I'm sure this will be great to build together with the kids. Thank you for sharing, Allie!